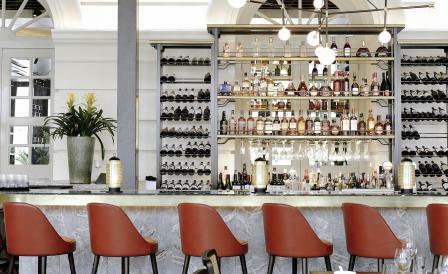 It’s no surprise that restaurateurs have long coveted the south-west corner of Singapore’s Asian Civilisations Museum – the views of the Singapore River, its graceful curve of fin de siècle shop-houses and the towering skyscrapers of Raffles Place from this spot are unrivalled. Dinner on the terrace of Empress – one of the latest offerings from increasingly prolific The Privé Group – is therefore de rigueur, though locals will normally have hightailed it into the air-conditioned comfort of the serenely lit interiors by Singapore-based designers Takenouchi Webb. Here, the high-ceilinged space is anchored by a six-meter-long bar trimmed with bronze while gracefully proportioned geometric screens section off parts of the restaurant as needed. But it’s in gathering gloom of the tropical twilight that the Empress really comes into its own as pendant lights encased in bronze and etched glass bath the timber, rattan and leather furniture in a cosy warmth. All the better to revel in head chef Ricky Leung’s finessed takes on Cantonese cuisine. The flavours may be classical, but the technique and ingredients are firmly contemporary. Think roasted Spanish grain-fed Duroc pork; or a crispy white bait salad, a tried and true standard anywhere else, but here transformed by a vinaigrette of smashed young ginger and palm sugar.